April 16, 2016, 7:25 PM · Val Vigoda is an electric violinist, singer/songwriter, and founder of the musical trio GrooveLily. She has toured the world with Cyndi Lauper, Joe Jackson and the Trans-Siberian Orchestra. Val has also co-written, with Brendan Milburn, songs for Disney's Tinker Bell movies as well as the score for the stage musicals Striking 12, Sleeping Beauty Wakes, Toy Story: The Musical, and many others, including Ernest Shackleton Loves Me, starring Val as Kat, a contemporary composer and single mom who meets and falls in love with the time-traveling explorer. Val and I went to Princeton University together. We traveled in different circles then: I played the violin for two years in the University Orchestra, she was exploring the potential of the instrument when combined with singing in a rock band. After graduation I followed Val's career over the years, reconnecting through her kickstarter campaign for her one-woman show, Just Getting Good. Karen: I had a great group of friends in a community orchestra back in Massachusetts, and some of us played in a string quartet. We used to perform at the Farmers' Market and other places. It was all informal, and we got paid in vegetables, but it was great fun. Now I'm looking for an orchestra here, and I have to make new music friends. Val: Those kind of musical friendships are wonderful. I had relationships like that around chamber music in high school that I treasure. Karen: What made you want to branch out? Val: I always loved playing my violin and I always loved singing, but those were two separate things. Then, in college, when I started writing songs, I tried to do those things together in a band. It was difficult and awkward to do with a traditional violin. It wasn’t until I heard about Mark Wood and his Viper violins that I realized that that instrument was going to change my whole world, because my neck area could be free. I could turn my head, and sing, and I wouldn’t have to hold the violin with my hand. I could get out of first position if I wanted to. Karen: On violinist.com there are a handful of debates that never die, and one is about whether to use a shoulder rest. That’s not a shoulder rest, is it? Val: No, it's a chest support. It’s like a tripod from a camera. I was the first female Viper player so I had to adjust it and push it off to the side a little bit. Then it just stays on. I can turn my head and sing, I can pick up something, I can walk around with it. Karen: That’s awesome. There was also a poll on violinist.com not too long ago: Can you sing and play your violin at the same time? And 49% of people said no. Val: 51% said yes? That’s huge. Karen: Probably not sing as well as you do. Val: When I started, no one else was doing it, and I was getting discouraged. It was hard even to just play and sing an A at the same time. I got confused as to which note was which, and I couldn’t keep them in tune. The learning curve was intense. It was a basically painful sensation in my head for months. It was almost 2 years before I felt comfortable enough to perform a rhythmic part on the violin and sing at the same time. Karen: I have a lesson that I teach middle schoolers about learning a motor task—throwing a beanbag at a target—and then putting on prism goggles that shift your visual field and having to re-learn the task. In the process of developing that lesson, I saw a video about learning to ride a bike where the handlebars turn opposite to the wheel. It took the guy about 8 months to finally be able to ride that bike. It sounds like a similar process: you have to retrain connections in your brain to do a set of complex, coordinated motor skills. And it was interesting that his son, who was about 6, could learn to do it much faster. It reminds me of learning to play the violin as an adult. There is brain plasticity in adulthood, but it’s like the difference between an 8-month learning curve for an adult and a 3-week learning curve for a child. It’s easier for the child, and doesn't take him as long, but they both eventually get there, and the adult has the maturity and perseverance to keep at it even in the face of discouragement and slow progress. Val: At the Electrify Your Strings event that I participated in recently in San Antonio, I got to work with some middle schoolers. With a lot of classical training, you’re taught to just look at the notes on the page, play that, not move. And then you get kids who are pretty stressed out—they think OMG I have to get the right note! 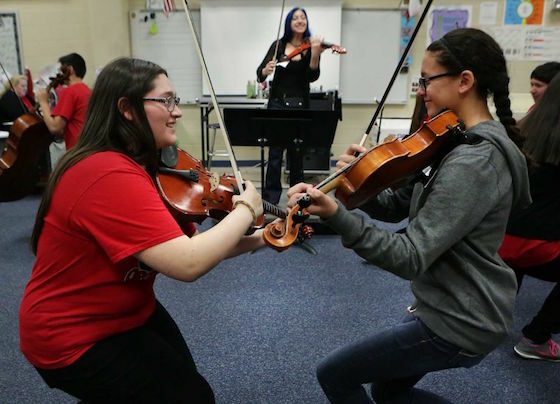 So the middle schoolers took a bit of cajoling, to get them all loosened up, moving around, and having eye contact with another human being when they’re playing. That’s difficult if you’ve never done that before. The high schoolers are even more entrenched. Most of us are completely still, and as a result, I would say almost 100% of string players have a problem with rushing. I do too. The way to not rush is to ground your body in the rhythm. I must have spent half the time teaching them to move their feet subtly to the beat, and suddenly, instead of flying ahead of the beat, we are sinking into it. You can do that from an orchestra chair, you can do that from wherever you are, but to engage your whole being into the performance is the goal. I am so passionate about this! Karen: I used to tap my foot when I was a kid in orchestra, and I was told not to. It’s interesting that in bands it’s fine to tap your foot, but in orchestras it is frowned upon. I still tap one of my toes inside my shoe sometimes. Val: If feeling the music with your body is frowned upon, then there is a serious problem with our classical music training, and that is what we are fighting against. There’s no reason to be stuck in hundreds of years ago, and let’s not be a one-trick pony. We are living now, let’s play our classical music beautifully and also open our eyes to what we can create! Karen: When’s the last time you played classical music? Val: Well, I got out my Mendelssohn and my Bach Sonatas and Partitas, and it was so nostalgic. That was my warhorse for my whole senior year of high school. It was what I played in all my competitions. I played the Khachaturian and I played the Mendelssohn final movement. I got a chance to play it once with an orchestra. Now, with Electrify Your Strings, I’m playing in orchestras again. And it's an amazing feeling! Karen: Tell me more about about Electrify Your Strings. Val: It was founded by Mark Wood, who invented the Viper violin. It’s in its 16th or 17th year, and it’s growing and growing. I think it's revolutionizing string pedagogy. We're going to 100 schools this year, and I’m the newest artist/mentor. I’m also there to show what different things you can do with stringed instruments. We all do solo performances in the middle of the concert. So Mark Wood does shred violin, Haydn Vitera does Latin-tinged country rock, I do solo live looping. We run the gamut of styles from Motown to hard rock to musical theatre, and show the kids what I truly believe: whatever you can imagine, you can create. On your violin. Karen: How much of a commitment is Electrify Your Strings? How would you get them to come to your school? Val: If you're interested, contact electrifyyourstrings.com. You have to book about a year in advance. They work with school groups, traditional middle and high school programs, and elementary as well. Choirs too. Karen: So it's not just violins. Val: Oh, no, it includes violas, cellos, basses. The cellists are standing up with their cellos, they extend their endpins and everyone can move. I'll be teaching again at the Mark Wood Orchestra Camp for a week in July. 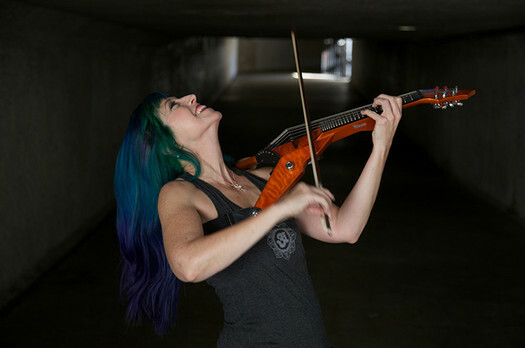 I will get to teach the same sorts of things as we have done in Electrify Your Strings: improv, performance energy, and a live looping workshop. I'm thrilled to be a part of it. It feeds my soul, feels like giving back. Karen: You have a nice video on YouTube explaining what live looping is, but I want to clarify what's “live” about it. Are you putting in tracks in real time? Val: Yes, it's not a band in the box where you put in the tracks and then play over it. I’m using a program called Ableton Live, and I use pedals that navigate me around the matrix. For example, first I can navigate to this area where I’m going to record the first violin part. Then I navigate away from that and record vocals and violin at the same time. I just layer it, and navigate from section to section. Karen: So let's say you recorded 8 bars of the violin part. Then you have it waiting, and you bring it in at some point by pressing a pedal with your foot while you're doing something else? Val: You can have a bass line going. Then you play the bass line while you're singing the first verse, you record the bass line while you're singing the pre-chorus, record the bass on the chorus while you're playing the chorus, and the next time around, while you're singing the second verse you're playing a higher part on the violin while it's going on. You keep building it throughout the song arrangement. Karen: If you were going to perform the song again the next night, you wouldn’t use the violin part you recorded the previous night, and it might be a little different each time you perform it? Val: Right, I put it in fresh each time. And if there’s a violin solo section, that would be different. The improvisatory part is something I used to be fearful of, though. I think it’s because of the way we’re taught. I’m excited to help kids get over their fears, get out of their heads, and become comfortable improvising because it’s something I’ve had to overcome myself. It's an important aspect of becoming the kind of musician that I want to be in this world. I think it translates to being that kind of person. I'm on a quest for presence in my life. Karen: Hmm. Honestly, I’m not much on improvising. I didn’t learn it as a kid, but I also didn’t seek it out. I think there are people who are naturally not interested. It’s not just that they are fearful or that they were taught to be that way. Val: Oh, I'm not accusing people of not being present in their lives because they don’t choose to improvise. For me personally, though, it is related. Karen: I can see that too. I've actually been doing a little improvising now, since I started playing again, but I don’t think that when I was 15 I could have. There was a joy that came from playing in an orchestra, and playing the music the composer wants you to play, and losing yourself in that. You become part of the whole, as opposed to you being present. That’s the kind of thing I found in an orchestra when I was younger and why I still like playing in an orchestra now. I've started to see two different sides, and they’re both interesting. There’s nothing wrong with the traditional orchestral model either. Val: Definitely. I’m not in any way denigrating that. I also miss that feeling. Like playing Handel’s Messiah with 500 people around you. You’re just a tiny little cog in this whole wheel of beauty. That is transcendent. And not to be belittled just because you want to do improvisation. It’s complementary, it’s both and, it’s not either or. Karen: I wanted to ask you about Ernest Shackleton Loves Me. My father has read biographies of him and other explorers. I haven't. But I think now, the show seems like it could bring together a diverse audience, like me and my dad; we both want to go see this show. 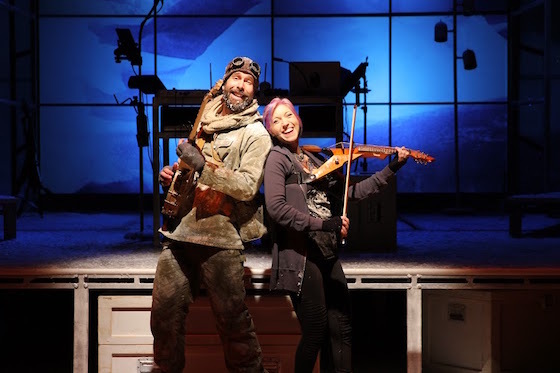 So, where did this idea come from, a rock violin show about Ernest Shackleton? (laughs) It’s creative, really interesting. Val: Thank you, yeah, it’s wacky. It is the product of this interesting combination of brains: me, Brendan Milburn and Joe DiPietro. Long ago, Brendan and I saw a museum exhibit about Shackleton, and it was so powerful that we just kept thinking and talking about him for years afterwards, because of his incredible optimism and because the exhibit featured the actual images and film from the expedition (a disastrous expedition in which his ship was trapped in ice, then crushed; yet he and his crew miraculously survived an entire Antarctic winter). They were only able to save 200 of these heavy glass plates from the ship, but they are the real, actual images. When you see the museum exhibit and you hear the story of Shackleton, and the harrowing ordeal, and you see the ship being crushed and you know it’s not a simulation, it’s the real thing, it feels like it punches you in the gut. It feels so immediate, and the story is so unbelievable but it’s true! Forever after that whenever anything would go wrong--some obstacle--and we would get depressed, it would be, “Think of Shackleton." Then we had a talk about what was going to make us each happy in the future. 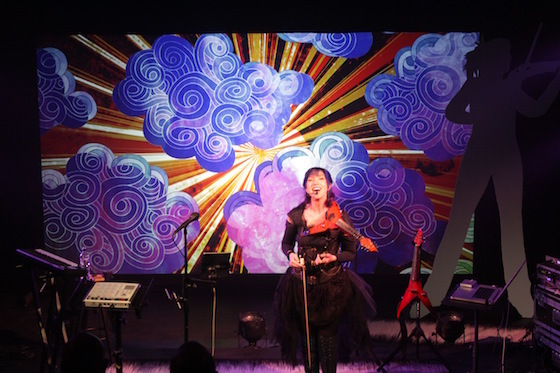 I love performing so much, I get such exhilaration and energy from that feedback loop with the audience. And even though he's wonderful at performing, Brendan would rather be behind the scenes at the computer, being a producer, being an arranger. So we thought, “how about we write something that I could perform and Brendan wouldn’t have to?” We went to see a bunch of solo shows, and many of them were autobiographical, and so personal, and that just wasn’t a direction I wanted to go in. Then we were introduced to Joe DiPietro, an amazing playwright, and we were throwing out ideas, and I was saying, “I really want it to be about something epic, something that will resonate with lots of people, like, I don’t know, like Ernest Shackleton!" (laughs) I blurted it out. And Joe didn’t know who he was. He said, who is Ernest Shackleton? I told him the story, and happened to mention the importance of the banjo in the story. Karen: What is the importance of the banjo? Val: Shackleton knew that music was crucial to keep up the morale of his men. He couldn’t allow them to despair. 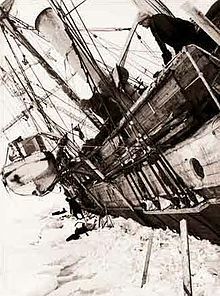 So that even when they are on the ice floe with nothing but seal blubber, frostbitten and starving, and World War I has begun, so no one is going to come rescue them--I mean, if there’s a recipe for despair, that’s it--Shackleton had to keep all these men in good spirits. He made them carry that freaking 14-lb banjo (pictured left) over the ice floes, even though each man was only allowed 2 pounds of personal gear. He kept the music going and that was part of what saved them. As soon as Joe heard that, he said, “That’s our way in, I know what to do!” He came back a week later with an outline. The idea was that the main character, Kat, was a modern composer, based on me. We were living in Brooklyn at the time and he assessed our lives and our sleep deprivation. We had a baby who would not sleep—he’s part of the story as well. Karen: So the plot was written by Joe? Val: He’s the book writer, we wrote the score, and we collaborated closely with our director as well. Plot points could come from anywhere. For example, Kat is learning about Shackleton on Wikipedia, and all of the sudden he comes through her refrigerator. Through space and time he’s made his grand entrance, her apartment has become Antarctica and they are on the expedition together. That is one of the best entrances ever! That plot point was devised by our producer’s intern. One of the things that I love so much about theater is how collaborative it is. I get to tell this unbelievably uplifting, powerful story of hope and optimism and resilience and I get to do it through the lens of this character that we can all relate to in 2016! That’s why I agree with you, I do think it is something that can bring people together. It’s accessible and appealing to people like your dad, people like you, people possibly like your kids. So far we’ve been finding that it works on all of those levels, plus it’s funny as hell. It’s sort of like Electrify your Strings, I can’t imagine a more worthy endeavor than to bring this sort of energy, connection, hope, this sort of message, to people. The fact that I get to do this, professionally, I’m so lucky! Karen: Before we close, is there anything you would be willing to say about family life and performing? It’s interesting that you and Brendan have been able to have this creative partnership for so long. And you have a young son. I was wondering how you manage to balance work and family with such an unusual career. Val: That is definitely a work in progress. Our marriage ended a year ago. We had become a bit too enmeshed, and now, after a painful year of upheaval and growth, we are finding our way to what we are meant to be, which is artistic, creative partners, dear friends, and co-parents. As I look at all the projects I’m involved in, what I’m learning, especially if you're in an uncertain business like music, is that it’s easy to get into a cycle of overwork and worry. In having to take a huge step back, I am coming to a much more spiritual place. That’s partly why I’m on this quest for presence. I’m meditating now, every morning. It is making the difference between waking up with the first thought in my head being “oh my god I’ll never get everything done,” vs. waking up half an hour earlier and meditating about oneness with the universe and compassion and gratitude for all the wonder of life, and then going and waking up my son. I’m a different mama. It’s slower, and more deliberate. It's so much better that way. So Chapter 2 is just beginning. In honor of this I’m going to officially go by “Val Vigoda” instead of “Valerie." Taking a new name feels like a little bit of a shift. 2.0. Where we’ve landed is a place of finding that work/life balance in not seeing each other 24 hours a day. I believe that Milburn and Vigoda, the partnership, is stronger than ever.